I was trapped at my mom’s house on Long Island last weekend. The blizzard came rolling in. A tree fell on a power line. A fire started in the street. My mom and I bundled up under two blankets on the couch with hats, gloves, scarves, 5 layers and multiple pairs of socks. When the “freak out” died down we decided to get a fire going (in the fireplace, where they belong) and open a bottle of wine. The color of the wine is an important distinction when I share what I am about to share…which is that I later kicked my leg out from under a blanket and knocked my wine glass off the table it was perched upon. Needless to say, the glass went flying to the floor but not before it made a pit stop all over the couch. Did I mention it was red? So. That was a fun night. The next morning we were still power-less, no plows in sight. 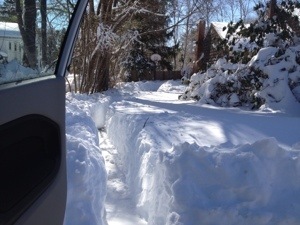 I decided to shovel out the driveway if for no other reason than boredom coupled with an interest in getting a little workout and not being trapped for a week. I covered about half of the driveway and then the plows came and then the power came on and even though the trains still weren’t running it was time to rejoice. It was an imperfect and completely unexpected weekend but it actually wasn’t terrible. In fact, parts were quite nice. I got in some bonding time with my mom (feverishly cleaning wine off a couch by candlelight will bring ya close); I was able to attend a friend’s (wonderful) play on Sunday before heading home; I made the amazing decision to begin watching Buffy again on Netflix and am now totally sucked in and my life is over and I am 14 all over again and I can’t stop and it is a sickness…okay, maybe that one wasn’t for the best but jury’s still out. Even still…I’d say worse things have happened on a “perfect” weekend.